After purchasing mini casserole baking dishes, simply because they were cute, I kept them on my counter where they sat for about a month having no other purpose than to make me smile. 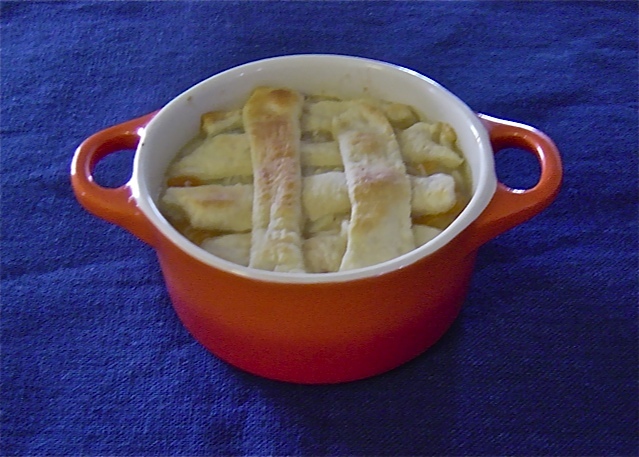 When I finally decided to bake something in them, I wasn't going to put it on my blog because let's face it, how many people buy mini casserole dishes because they're precious? But when I realized you could use this same recipe, baking in small ramekin bowls, I just had to share this easy and tasty recipe. Mix chicken, vegetables, chicken broth, cornstarch, bouillon and seasonings in a bowl. (I shook the cornstarch with a little bit of broth in a container first to dissolve it, then poured it in the chicken mixture). Spoon mixture into four mini casserole dishes or ramekins. Take a few of the crescent rolls and cut them into thin strips (about 1/2 inch wide) and long enough to fit the dishes lengthwise. Bake at 375 degrees for 10 to 12 minutes. Enjoy! If you'd like a printer-friendly version of this recipe, Click Here.